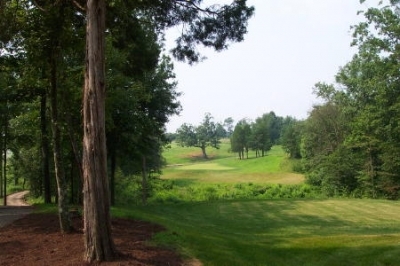 LOCUST GROVE, VA -- "I guess you could say it's almost like returning from the dead," remarked Somerset Golf Club's General Manager/Head Golf Professional, Bart Wolfe, when describing the short but eventful history of his golf club. Somerset did just that -- return to life -- after being shut down and dare I say it, left for 'dead,' a little over a year ago. Perhaps those in the know would say otherwise, but many of us thought the golf club may very well be buried -- or even worse, cannibalized for house plots. Looking towards the green of Somerset Golf Club's 5th hole -- one of the holes that'll play quite a bit differently after the redesign work. Note: These photos were taken during construction, prior to opening. Any resurrection scenario conjures up religious overtones, and though Somerset's return to playing status is definitely a remarkable story, it hardly sheds Biblical allusions. It's a widely known industry fact that many golf courses are struggling to attract enough business to keep their doors open in the aftermath of the recession and September 11th's tragedies, but Somerset is one of the relative few that actually hung out a 'closed' sign and decided to start over. 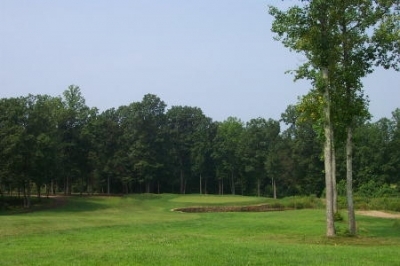 The 'original' Somerset opened its first nine holes in 1997, a Jerry Slack design set amongst the rolling and densely forested (in spots) pastoral farm lands of central Virginia (about fifteen minutes west of Fredericksburg off of Rt. 3). The second nine holes completed the track a year later. 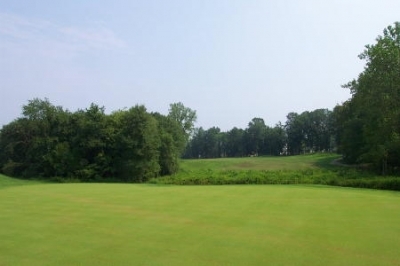 For those who first tried the course, they found a lot of very enjoyable holes, a few that they wanted to 'blow up' (this is an actual quote from one player), and unfortunately for the folks managing the facility at the time, a less than burning desire to return. I myself last saw the course in August of 1999, and there'd been a noticeable conditions decline in the year between then and my first visit in July of 1998. The situation subsequently worsened to a point where even the Fredericksburg area tourism authorities recommended against having me write a review, fearing bad press. Wolfe continues the story: "The golf course became so run down that the owners decided late last summer (2002) to basically close it up, completely re-grass the course, and while they were at it, redesign the four holes that had given Somerset a 'quirky' reputation. It seems there were fourteen holes that everybody enjoyed, and we decided to make the quirky holes into four of our better holes, and I'm happy to say, we've done it." The 15th hole measures 249 yards from the back tees (par three) -- at that distance, you'll note there's very little trouble other than yardage. Yes sir. Having seen the 'before' and 'after' product, there's no doubt a significant metamorphosis took place along the banks of the Rapidan River. Because of the nature of the terrain, the course will always play difficult -- but now, at least, you won't walk away from a round desiring to 'blow up' anything. As Wolfe mentioned, the main problem was a set of four holes that, as Forrest Gump would say, 'just didn't make no sense' -- two on the front side, and the finishing two holes. All four involved poor thinking in the design, blind shots, unmanageable carries, or a combination of all of the above. 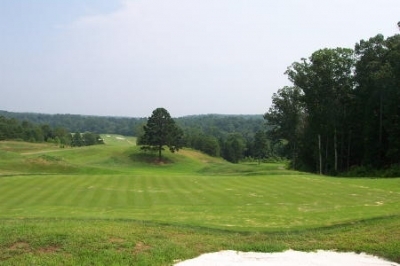 Somerset's new management company, Lighthouse Golf Group (Marietta, GA), hired Golf Architect Rick Robbins, a respected designer out of Cary, North Carolina to handle the redesign issues. Wolfe said they chose Robbins because of his reputation, but also his ability to renovate (resurrect?) previously troubled golf courses. "Robbins came in and rebuilt the four holes that people just couldn't understand why they were designed that way in the first place -- and made them into very nice holes. Then he put in new tees on some of the other holes, filled in a couple ponds that took away from a couple holes, added a few new bunkers, removed some trees... all in the name of making the course more playable, enjoyable and fair. For the average player, we reduced the carries over the marsh areas throughout the course, and made every effort to soften up the layout so people will want to play here on a regular basis," Wolfe said. The 4th hole used to have a huge tree right in the middle of the fairway. It's gone, but there's still plenty left to make this a very tough hole. Despite the changes, the course still has plenty of muscle. "But at the same time, if you choose to try our back tees, (6725 yards, par 72), the course is every bit as challenging as you're going to want," added Wolfe. This player will vouch for that. "And if you add in the peerless quality of our setting out here, we think we've got a real formula for success. It's hard to find a club with better views, and the variety that this golf course presents is second-to-none. Every hole is a new challenge, a new adventure. You'll use every shot you've got, and that's what makes it extra special," Wolfe says. Also, as alluded to earlier, a major part of Somerset's 'resurrection' includes re-conditioning the course. That involves completely changing the types of grasses at the facility. For those of you with crabgrass infested front lawns, you know it's no easy task to make the 'good' stuff grow, while eradicating the 'bad' stuff at the same time. This season's unusual weather hasn't helped things, but steady progress is being made. You can't see it here, but there's a new aiming bunker off the tee of the 469 yard, par four 7th. You'll have to hit it long and accurate to be here in two. Under Superintendent Jason Brostrom's (Valley Crest Golf Course Maintenance Company) direction, things are growing profusely at Somerset -- though Wolfe admits it'll probably be next spring before everything's completely in order, with warm season grasses supplanting the cool season greenery they've been working hard to foster this year. 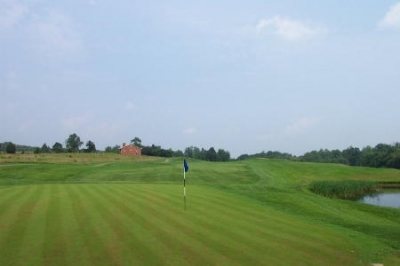 "All the greens were completely replanted with L93 bentgrass, which is very heat tolerant and doesn't require the same airflow and sunshine as some of the more traditional grasses (note: Somerset's previous managers had a very difficult time keeping some problem greens alive). L93 takes about a year to establish, and we're still in that stage right now. When it's completely grown in, it'll allow us to cut the greens at just about any height we want -- for tournaments, everyday play or according to the growing conditions," Wolfe proclaimed proudly. He continues, "Our fairways and tees are Kentucky Bluegrass that we'll overseed with rye, and we've got a lot of natural fescue areas that are very beautiful. Before, this club had kind of a hodgepodge of different grasses, which was a major cause of the problems keeping consistent playing surfaces. When everything's mature, we won't have to worry about that again." Another conditioning issue the 'old' Somerset encountered frequently was maintaining the course's border areas. That not only made a tight course (in spots) tighter, it also concealed one of the property's major assets -- views of the Rapidan River. I'll confess, having played the course three times prior to its reopening, I never even knew the water was there. 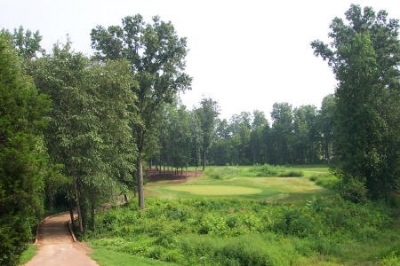 The 3rd hole features a walled-pond front and right of the green. Wolfe says that too, will change: "I was here for two months before I realized that the river went around that entire side of the golf course. The vegetation around the edges was so dense that you couldn't see it, and it's very close. One day, I was out there and heard the river flowing by -- so I walked to the edge and there it was. We're excited about the possibility of opening up some of those river views. And we're going to do that essentially by clearing and trimming a lot of the underbrush, not by taking out trees. We're being as sensitive to tree removal as possible to bring out the beauty of the property." Other changes are being made to re-establish a sense of tradition at the club, dispelling the 'quirky' reputation at the same time. The most telling change is the re-naming of the link between holes twelve and fourteen. Under the previous 'regime,' the thirteenth hole ceased to be. Wolfe speaks: "Being located just a few miles from some pretty heavy battles during the Civil War, this property has some interesting history to it. There's a brick house on site that dates to 1831, which was used as a hospital during the war. Perhaps because of it, several ghost stories have circulated -- lending us a 'haunted' reputation." "Well, apparently several strange things happened on the thirteenth hole, so they (the previous management) decided to rename it the fourteenth hole, in an attempt to prevent those weird occurrences from happening," Wolfe mused. There's quite a view looking down from in back of the 18th green. The 'new,' 385 yard par four supplants a fairly ridiculous previous par five finishing hole. 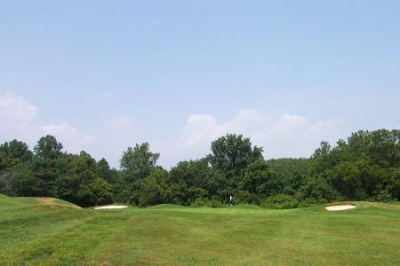 At the 'new' Somerset, the thirteenth hole is back, but who knows if the demons have been exercised: "We're definitely putting the holes back in numerical sequence," Wolfe said, "but we've also had some equipment break down on that hole that worked just fine everywhere else. Hopefully the spirits will go easy on us in the future," he chuckled. Ghosts or not, the folks at Somerset are making it easy for people to want to come see the 'new' club, with a preview rate that's good until the end of this month (September). The course officially re-opened on August 29th, and offers the preview rate to allow folks a chance to see the course at a discounted rate. "We want everyone to see the positive changes we've made -- not only in the redesign, but also the overall conditioning of the golf course. We're still waiting for a few areas to mature, but they should be ready by the end of the preview period. People should understand that the course isn't perfect yet -- it will be soon -- but they can see the progress we're making towards it," Wolfe said. Until the end of September, the rates are $29.95 Monday through Thursday, and $19.95 after two. Friday through Sunday, you can play for $39.95, and $29.95 after two. All rates include cart. See below for the post-preview rates, which are still very reasonable. The 180 yard, par three 6th hole is much the same as it was before -- and that's a good thing, because it's still a great hole. It should be said that Somerset already had a nice clubhouse prior to its renovation, and providing service with hospitality is a given from these folks -- you can tell just from their attitudes. Wolfe puts it best: "I want our players to leave here thinking, 'What a great value we had here today. For the service we received, the quality of the golf holes, the changes they made and are continuing to make, this was the best value we got all year -- and I can't wait to come back.'" There definitely is quite a difference between the old and the new at Somerset, and it's nice to see that something like this golf course can really 'resurrect' itself from bad times. It just goes to show, you really can come back, better than ever. Note: Somerset Golf Club is also under new financial arrangements. It was leased by a non-profit foundation, Somerset Educational Foundation, whose Board is comprised primarily of local business people. After October 1, 2003: Mon-Thurs: $37, $32 after noon. Friday through Sunday and holidays: $52, $47 after noon. Winter rates also available, December through March. Mon-Thurs: $32, $27 after noon. Friday, $37, $32 after noon. Weekends and holidays, $47, $42 after noon. There are also several levels of memberships available. There's the full-service Premier Membership, which allows play at anytime, on all days. There's a weekday only membership, which is good all day on weekdays and in the afternoons on weekends and holidays. There's a senior membership, which provides the benefits of the above programs at reduced rates. Finally, there's an associate membership, which gives considerable discounts on play for a small annual fee. Check with the club for details.